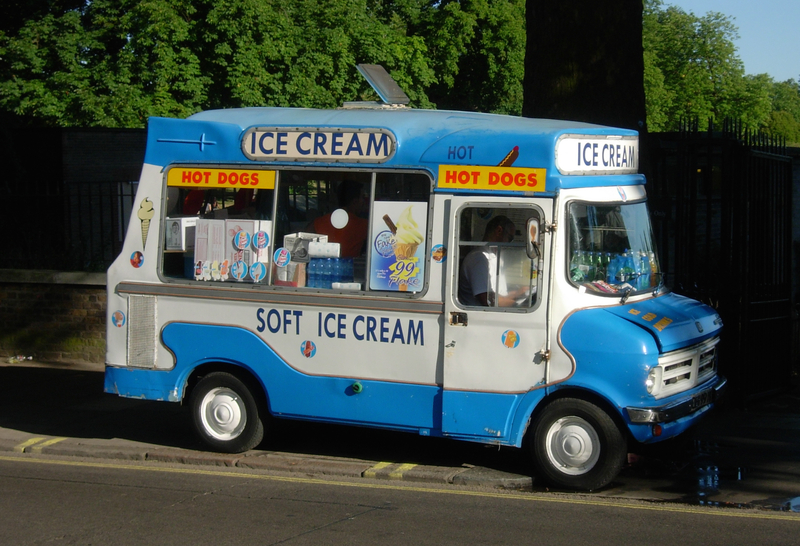 Ice cream vans remind me of childhood. 99 Flakes, Screwballs with forbidden bubble gum lurking in the bottom, ice cream dribbling down cones and making my hands sticky. Now I’m too old for these fascinations I peer into the vans, intrigued by who might be manning them. And there he was: surprisingly young, tousled blonde hair, open necked polo shirt. He had no customers and filled this void by strumming his guitar. Was it an alternative Pied Piper tune to attract sugar-hungry punters? As I passed, he flashed a toothy grin; no, he was just happy. One is never too old for these fascinations. Dreamsicles are my personal favorites. Give me the smile anyday. Never too old for these fascinations! I had a Tonki toy of one of these. It had a key at the back which you could wind up and it would play a tune. So nostalgic!